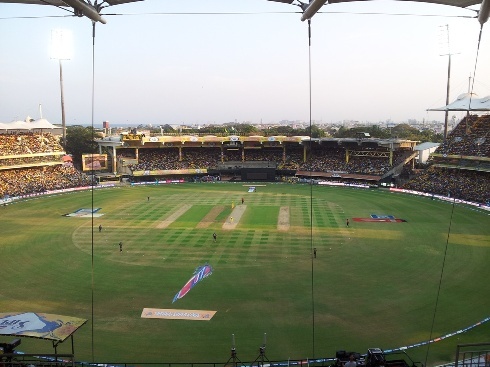 The D-Day arrived as we made our way to Chepauk….it was yellow fever there!!! What a scene it turns out, in an otherwise somber place. Thanks to Vinod for driving me to Chepauk. Both of us were in the traditional yellow jerseys and rushed to wait for Srikanth & Sanjay (making his debut of watching a live match at Chepauk). We made our way after the hurdles (literally) and were pleasantly surprised to be handed over a free CSK T Shirt!!! (later, the TShirt came handy for ‘Ganguly’ style (read as the balcony in England, Natwest series)…forget the Gangnam style). One more advancement in MAC is seating as per the allocated seats, atleast in this stand..E Upper, right opposite to pavilion. Sanjay converted the 4,6 posters in to a horn and it was an unique sound, which made a distinction in the otherwise screaming crowd!!!. The horn impact was working well in CSK’s innings, but on the opposite in KKR innings and we had to abandon it mid way :). And what noise it was..nothing new in Chepauk, but we are definitely a crazy, crazy set of people for cricket. Just to mention about the surroundings, a family came in with an around 3 yr old girl, who was jumping chanting Dhoni’s name (did I know what was cricket at that stage??) and with all the excitement, she fell asleep after some time and they also left pretty early. Next to me was a boy with his father, and he should be around 12-13 yrs of age and with him was one more small boy of about 7-8 yrs age and they were discussing on field positions and their thoughts on the same, may be Dhoni had to take some cue from them!!!! And the Fabulous Four…i.e me, Vinod, Srikanth & Sanjay had a nice time, with a close win!!!. A big thanks to Vijay for arranging the tickets. It’s always a great feeling to watch the match live at the stadium…what noise, excitement, action and it is endless memories. Here’s wishing CSK many success in IPL 2013 and roaring from the Lion’s den!!! Post match, we also watched the Super Sixes Challenge, in which Albie from CSK hit one for 101 mts and Brett Lee was was KKR and managed to just hit 1 six, over the line, it was no match for the mighty Albie. All in all, a great evening, a win to cherish!!!! Posting this on a work day afternoon…sir romba busy pola !! Vinod Nagarajan liked this on Facebook. Krishna Kumar liked this on Facebook. Sanjay Srinivasan liked this on Facebook.